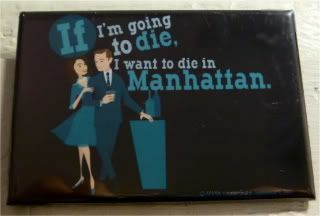 My sister bought me this fantastic Mad Men magnet, and I can't think of any other truer sentiment for the End of the World. All things considered, there wasn't any other way I'd rather have spent the last day on earth, than Saturday morning cartoons, diner breakfast for lunch, dragging a friend to the NY Public Library's Centennial Celebration and showing him around one of my favorite buildings in town, giving the same 5-cent tour to another friend who's lived here most of her life and never been inside, discovering a new (to me) Cuban restaurant serving $6 Happy Hour Mojitos (so going back! ), and some late-night shopping at Macy's. Yep, a little tv, food, architecture, history, fun and friendship. Best day ever, and quintessential New York. Seriously. If the End of the World had happened while I was drinking those Mojitos last night? I'd have been perfectly content. Now, we just have to wait til October. Or you know, 2012, if you're Mayan.